Standing almost 33"H, this mighty lion really makes a statement. He is made from layers of wood that are cut from "1x12" and "2x12" stock. Make one for each side of the porch or driveway. He is pictured with a standard 10" glass gazing ball which is not included. 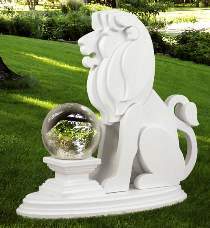 Make this lion with or without the oval base and gazing ball. All patterns are drawn FULL SIZE.